There's something about Mortal Kombat. I've stopped playing—or at least stopped really caring—about most other fighting games. Street Fighter V? I'm excited for you fans! Smash Bros? I'll play it when friends are around. Tekken? I don't even know. But Mortal Kombat. Something about it immediately brings me back—to birthdays spent in arcades, to long days spent at my childhood hockey rink with the Mortal Kombat 3 cabinet tucked into the corner, to playing some of the... lesser Mortal Kombat entries on PS2. I pick up the controller. I choose Scorpion. I rip a few spines out. I'm back. Earlier this week I played Mortal Kombat X, the follow-up to 2011's (excellent) Mortal Kombat (hereafter referred to as Mortal Kombat IX for clarity), which was basically developer NetherRealm's "Let's throw out all this bloated garbage the series has accumulated over the last two decades and just make a good Mortal Kombat game again." You can't reboot twice, though. The challenge with Mortal Kombat X is to sell people on an expanded Mortal Kombat canon, without falling into some of the same traps as Mortal Kombat 4 through Armageddon. No pressure or anything, NetherRealm! I played the game earlier this week. Here's what I took away from my hour of time. If you're anticipating huge changes from Mortal Kombat IX, I think you'd best temper those expectations. X feels like IX, but refined. The biggest change is on the roster side. Each character now comes in three variants—for instance the Ninjitsu Scorpion iteration wields dual swords so you have a bit more reach, Inferno Scorpion can throw a demon at opponents, and the Hellfire Scorpion has extra fire-based attacks. Some players won't notice the difference beyond "Oh, cool, three Scorpions." NetherRealm says the change came as a result of high-level play though. "What we found in our past games is that a lot of players, even the competitive ones, sort of gravitate towards a favorite [character] but that favorite might not always be a great match-up for you," said NetherRealm's Brian Goodman. Now we've given you a system where you stick with your favorite character, but we're giving you an option to choose a different style of play depending on the match-up." With this new system, people who mostly play one character can still choose the best variant of said character to take on any challenge. Ninety percent of the moveset will be the same—"Scorpion will still play like Scorpion," as Goodman said to me—but you'll have some new advantages and disadvantages. Also, X-Ray moves and fatalities carry across all three variants. As for how it plays: 1) It's beautiful. 2) It still feels like Mortal Kombat. 3) It seems a trifle slowed down compared to Mortal Kombat IX. Per that last point, I could just be imagining things. I haven't played Mortal Kombat IX in a couple of years now, so it's hard to judge the two without having them side-by-side. It did feel a little more sluggish and/or deliberate than I expected though, regardless of which character I chose. I'll investigate that claim a bit more when it's review time. If you typically play Mortal Kombat for a bit of the ol' ultraviolence, damn does Mortal Kombat X deliver. There's nothing that'll necessarily surprise you here—X-ray moves are back, fatalities are still super-fatal, et cetera. NetherRealm is quite good at coming up with creative ways to murder and/or seriously maim people, though. One X-Ray move that made me involuntarily cringe? Cassie Cage, who did a split and then punched Scorpion straight in the testicles before taking out her dual pistols and shooting him through both eyes. I can see Jack Thompson fanning himself right this very moment. 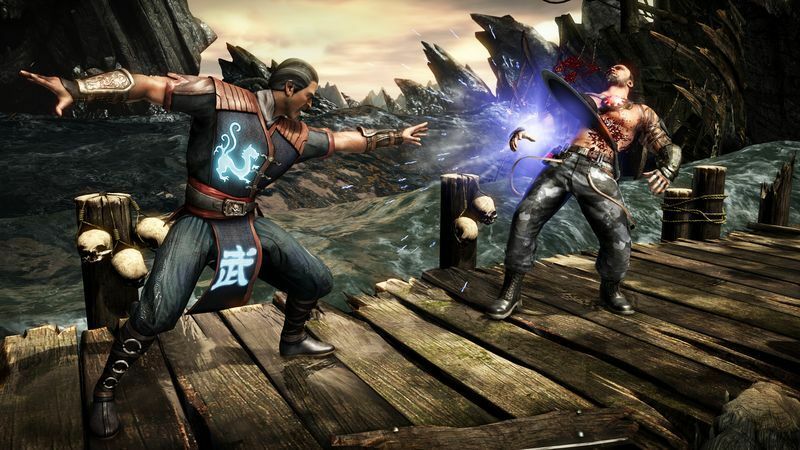 My one worry with said X-Ray moves is the same as Mortal Kombat IX: The first time you see it, it's shocking, but the effect diminishes over time and you're stuck watching what's basically a long, disruptive cutscene in the midst of a tightly-paced fight. It can really kill the momentum. 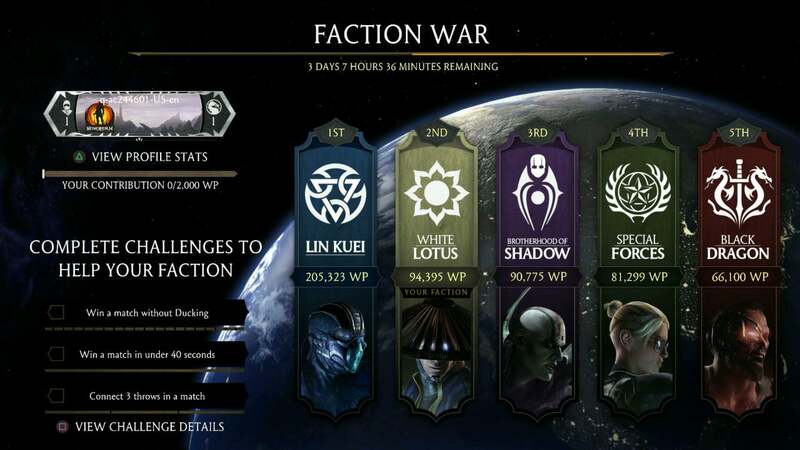 Factions are basically NetherRealm's attempt at a meta-game spanning across your Mortal Kombat X career. You might play campaign, then dabble in the Tower, then swap over to 1v1 online multiplayer for a bit. Or maybe you only ever play 1v1 local multiplayer. Whatever your preferred way to play Mortal Kombat, NetherRealm wants to make sure you feel like you're involved with the game and progressing in some way. Enter Factions. The first time you boot Mortal Kombat you'll be asked to choose one of five Factions, each based in the Mortal Kombat lore i.e. White Lotus. This is just a name designator, though. Goodman was quick to clarify your choice won't affect what characters you can play or anything along those lines, which I'll admit I'm a bit sad about (though it would be a logistical nightmare to lock players out of 4/5 of a fighting game's roster based on a boot-up choice). Like Ubisoft's The Crew, you then earn points for your faction just by playing Mortal Kombat—singleplayer, multiplayer, whatever. There will be specific challenges available to rack up bonus points, but you can choose to ignore those. Each week, one faction will be crowned winner and gain access to some benefits until they're dethroned. Goodman says the particulars haven't been worked out, but gave the catch-all "cosmetic items" as an example. And lest you think everyone will join the same faction day one and game the system, I did confirm with NetherRealm that there's some sort of point balancing going on in the back-end. It reminds me of Halo, Battlefield 4, or Destiny, where we started to see some sort of convergence between the typical multiplayer unlock schema and those who mainly want to play singleplayer. It's not necessarily something you have to engage in, but for those who want that extra layer of metagame? It's there. 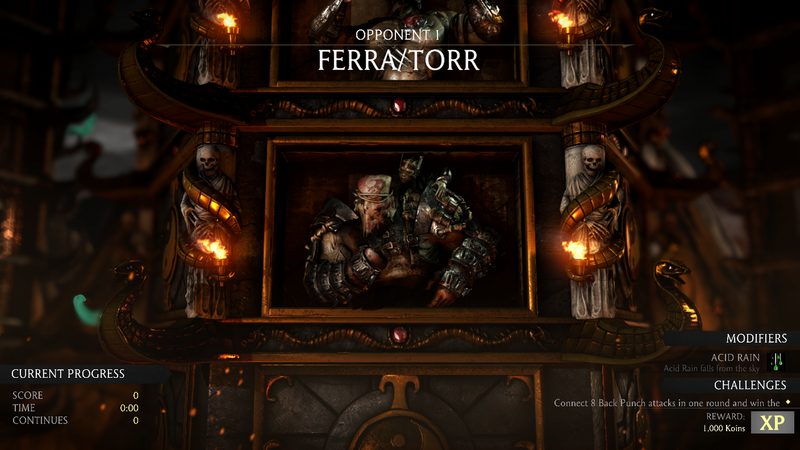 One of the modes revived for Mortal Kombat IX was the "Tower"—basically a play on the original arcade cabinet's singleplayer, which had you defeat progressively harder enemies through to the end. Mortal Kombat IX 's Tower was super long though, with 300 stages to progress through. As it turns out that was maybe too many for a lot of people. I chatted with Goodman about this—I started the Tower but never bothered finishing it, and while he said more people finished the mode than NetherRealm expected many did the same as me and quit part-way through. For Mortal Kombat X, NetherRealm is revamping the idea into what they call the "Living Tower." There are three separate tracks: Quick Tower, Daily Tower, and Premier Tower. The Quick Tower is five fights long and NetherRealm expects to change up what those five fights are every two to three hours. The Daily Tower is a bit longer, and will be refreshed every 24 hours, as you might expect. Lastly, the Premier Tower is going to be a special challenge trotted out around specific events. In other words, there might be a Halloween Tower or something along those lines. Themed how, you ask? The Tower fights will allow you to bring in any character you want, unlike Mortal Kombat IX's Tower (which required you to complete each of the 300 challenges with a specific character). Fights will still revolve around modifiers though—for instance, one fight might have bombs dropping out of the sky, while in the next fight the ground continually slopes back and forth and whoever's higher up gets hit with environmental attacks. 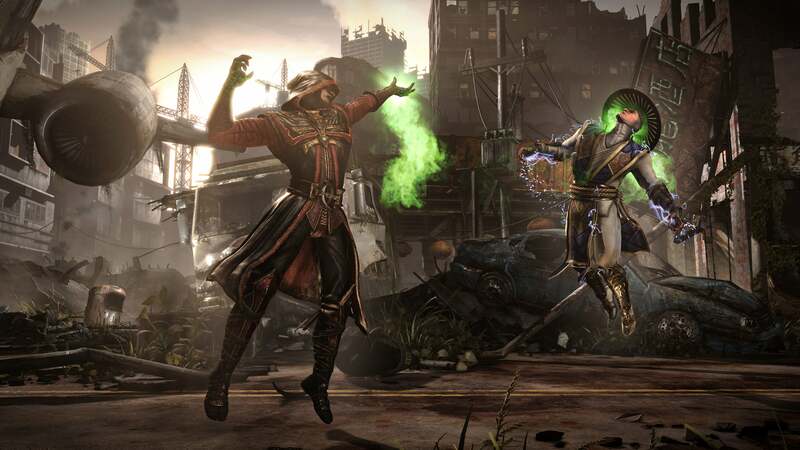 Whether the inclusion of these modifiers means that Mortal Kombat X will bring back my favorite mode from Mortal Kombat IX—"Test Your Luck," which was a 1v1 multiplayer mode with random effects applied to each fight—NetherRealm declined to comment. Either way, the new approach to the Tower seems like a better decision than 300 static fights, despite the cred you attained if you ever completed that mode in Mortal Kombat IX. In fact, the whole game's looking pretty good. And pretty brutal. 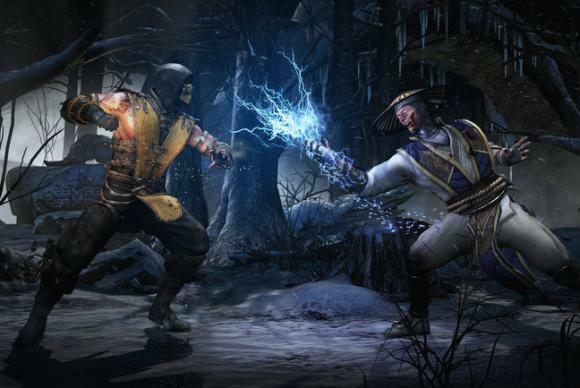 Mortal Kombat X is slated for an April release.